GUWAHATI: As Durga Puja celebrations began across the country, one idol of the Goddess in Guwahati is reaching for a higher laurel. At a 100-feet tall, a Durga statue made by local artisans is shooting for the Guinness Book of World Records for the record of the tallest-ever bamboo sculpture. Fifty-nine-year-old Nooruddin Ahmed, an art director who has created over 200 unique idols and pandals since 1975, is the man behind the project. “Last year, we made an 86-feet-tall bamboo structure here and then we thought why don’t we try to make a gigantic Durga idol with our own indigenous bamboo and maybe try for the Guinness Book,” Mr Ahmed said. It took 50 men more than two months to craft the idol at a cost of Rs. 15 lakh. 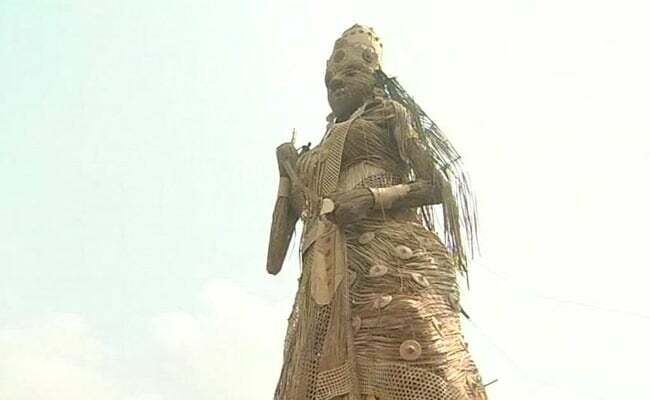 The 100-feet tall idol is eco-friendly and made only of jute and 5,000 bamboo poles. It took 50 men more than two months to craft the idol at a cost of Rs. 15 lakh. The 10-storey-tall Durga idol towers over last year’s 83-feet-tall idol made in Kolkata. “We are getting a huge response already. Even on social media there is so much excitement about this idol,” said Pijush Kanti Deb, the secretary of the Bishnupur Durga Puja committee in Guwahati which is hosting the idol. This ambitious project was almost abandoned when a storm blew the idol’s frame down last Sunday.